The softness of mousse with the texture of powder! 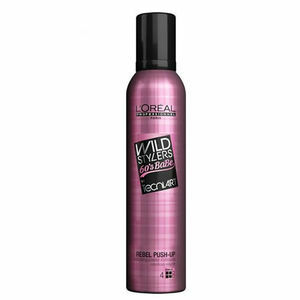 L'Oreal Professionnel tecni art Wild Stylers 60's Babe Rebel Push Up Mousse is a micro-powder that has been stablised in a texturizing powder-in-mousse, making it perfect for achieving styles with plenty of volume and an undone texture of a powder. It can be used for long-lasting root lift via blow-drying and curling for all hair lengths. Use before styling to help create a lightweight support layer for volume. It will also protect against humidity and hold the style. For rebellious levels of volume and the softness and manageability of a mousse, with the texture and durability of a powder, this product is tough to beat! Available in a 250-ml can. £9.36 (inc. VAT) Why no VAT? We're a trade wholesaler and quote our prices without VAT to help our VAT-registered customers understand the true cost of a purchase. Mineral powder fixing spray with a medium hold level of 3 designed to add texture and volume with a matt finish. Comes in a 250-ml aerosol spray. Deconstructing paste with a strong hold level of 4 designed to create reworkable hold with a matt finish. Comes in a 100-ml tube. Dishevelling gelée with a light hold level of 2 designed to create a tousled effect for rocking undone hair. Lasts up to 24 hours. Comes in a pump-action, 150-ml bottle.